Your macros are in order and you’re ready to start eating Keto. Go through your cupboards and rid yourself of tempting food items. Breads, pastas and sweets. But what foods are keto friendly? Well here is a short but by all means not comprehensive list. If you’re unsure of which foods are low carb try searching for them in MFP. You can input foods ahead of time when going out to eat or when planning meals for tomorrow to see how your food selections and portions change your macros. Also investigate nutritional labels on items you think are low carb and calculate the net carbs for yourself. You’ll be surprised how many products have added sugars! Not all low carb products are truly low carb. Some artificial sweeteners, such as sugar alcohols, count as carbs. Here is a one day sample menu as viewed in MFP. While your macros will be different from the ones listed (again, those are mine) you can easily modify any item or add/subtract from the menu. If you need more fat try adding cheese, butter or cream. Less fat? Use half as much butter. 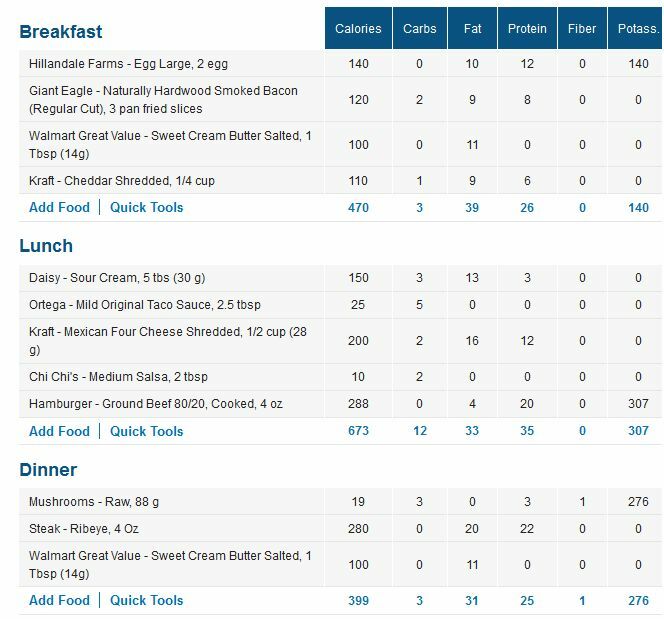 Play around with MFP to see how adding different foods change your macros. Here is the nutritional value for all the items listed below.